December 11th, 2014 · Comments Off on Are Timeshare Presentations Worth It? About ten years ago, on a trip to Las Vegas, my then-girlfriend (now wife) and her friends were stopped by one of the timeshare salesmen on the Strip. I was just out of college, they were in their last year, and so their offer of free show tickets for our group, in return for watching a timeshare presentation, was really enticing. Having never been to a timeshare presentation, I believed them when we were told it would only take an hour. In return, we’d get 10 tickets to a decent show, enough for our whole group. I was the only one with a job, which was crucial because that was part of the offer, so I had to go. Fast forward to the timeshare presentation, which was for Polo Towers, and it was, as I’ve come to learn, standard fare. They talked about how timeshares worked, the amenities of the building, how you could trade weeks, the various fees, and that whole spiel. On the face of it, it seemed like a decent deal, albeit pricier than what we were used to staying at 2nd tier Vegas resorts. Ultimately, I knew that timeshares were not fantastic deals (if you want a timeshare, buy it on the secondary market) and so I passed. The problem is that they keep passing you off to people and the promise of one hour ultimately became two and a half. They tried the soft sell, the hard sell, dropping the price, you name it. If there was a sales tactic to use, they used it. It was pretty Machiavellian if you ask me and it was pretty obvious they were racking their brains to try another tactic. In the end, they weren’t able to wear me out (I’m not the type to enter into a $30,000 agreement after an hour-long presentation!) and we got our tickets. Was it worth it? In our case, no. We got 10 tickets and probably saved our group maybe $400-500? In college, that’s pretty awesome. Our own personal benefit as only $80-$100 – which meant Martha and I collectively were paid around $20-25 an hour to listen to a presentation. I’m not one to turn my nose down on $25 tax free but that’s when I’m at home with few alternatives. $25 an hour to do something I don’t really want to do is a horrible deal when I’m on vacation! That said, there are timeshare presentations where you can get hotel stays, or stays on property, for a weekend in return for spending a few hours. I think those are entirely worth it. When I hear statistics that half of a timeshare’s sale price goes into marketing, I cringe at the thought of how cheap we were that weekend. In the end, you have to calculate how much you benefit and estimate how long you’ll be stuck in the presentation and decide for yourself. This past weekend, while attending my sister’s wedding in the hotel, we had the pleasure of staying at The Lenox in Boston, Massachusetts. It’s an absolutely lovely boutique hotel located on the corner of Exeter and Boylston Street and a block from several Boston highlights (Copeley Square, shopping on Newbury Street), though given the events of the day we didn’t get much sightseeing done. The service at the hotel was fantastic, which you should expect given the premium rates, but we were treated like royalty. Check in was a breeze, the staff was incredible, and anything and everything we wanted was provided. Traveling with an infant can be challenging but they provided a crib and even bath toys and stuffed animals for him to play with. It was the first time we’d ever been offered something like that at a hotel! Our room was exactly the one picture above (that’s their photo) and it’s as spacious as it looks. I’d never stayed in a hotel room with it’s own chandelier before 🙂 so that was a nice touch. The fireplace doesn’t work (says so in big letters) but we didn’t bring any of our own firewood so that was OK. The only difference with our room is that instead of the large chair by the fireplace we had a crib. There are two restaurants in the hotel – City Bar (which is mostly a bar) and City Table, where you can order food. We only had a drink in the City Bar but it was set up more like a lounge and provided a relaxing atmosphere. City Table was more restaurant-like with tables and was much louder. The hotel is part of the Stash Hotel Rewards network, so if you’re all about the points, you can still earn points staying there even though it’s a more independent hotel. Going on vacation? One of the many chores you have to remember is to hold your mail. In year’s past, this meant a trip to the post office and a wait in their ubiquitous line. Fortunately, the post office has entered the 21st century and now offers the ability to hold your mail online. You can set it up for same day stoppage if you enter it by 2AM Central (an odd time zone, but whatever) and the service is limited to certain zip codes but it’s worth a shot. No fee either, completely free! Spend all this new free time planning for your vacation! We’re going to head off on our two week trip to China and Taiwan shortly so we’ve started the planning phases of our trip. Number one on that list, as you’d expect for a travel blogger, is how we’ll keep all of our various gadgets and gizmos charged and ready. 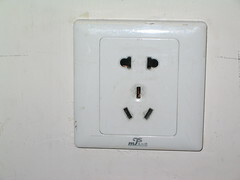 We all know that the plugs in other nations aren’t shaped the same as ours but that’s not all you have to watch out for. In North America, and parts of Central and South America, we use two parallel prongs. The sockets in the wall, if you check now, will have that and perhaps a third prong. Most other nations have similar setups, two or three prongs, but the shapes and orientation will be different. It can get really complicated so we typically bring along our set of adapters that should cover every major plug type. Even though we’ll only need the ones for China and Taiwan, we keep them together just so we don’t end up losing any adapters. If you’re going to buy a new one, I suggest getting one that has all the adapters together in one unit. It makes it even harder to lose individual ones since they’ll all be connected. It’s often cheaper too, though that depends on how fancy you get. Here’s the real tricky part – the United States uses an electrical system that provides 110 volts at the outlet. 220 volts is pretty much standard elsewhere, which means unless you have a converter, the excess juice will burn out your appliance. This is most important for small devices that draw little power, like a hairdryer or electric razor. Take a look at the device and it should tell you its power needs. I took a peek at my AC Adapter for my laptop and it says INPUT: 100-240V ~2.4A 50-60 Hz. That means it can handle up to 240V at a frequency of 50-60 Hz. For my computer, in China and Taiwan, all I need is an adapter so my two prong plug will fit in an outlet there. The adapter will handle converting it to what my computer can handle. Incidentally, China uses 220V, 50HZ while Taiwan uses 110V, 50 HZ. Imagine you’re on a flight and you’re hungry. If you were on a Southwest flight, you’d get some free crackers or peanuts, depending on the length of the flight. If you’re on Delta, you could buy a sandwich. If you bought a turkey sandwich, you might have gotten yourself a bonus needle. Sewing needles were found in turkey sandwiches served on four different flights but only one person was hurt. The needles have prompted the FBI to get involved and Delta has stopped all sandwiches prepared by a catering company in Amsterdam. “Delta is taking this matter extremely seriously and is cooperating with local and federal authorities who are investigating the incident. Delta has taken immediate action with our in-flight caterer at Amsterdam to ensure the safety and quality of the food we provide onboard our aircraft,” the airline said in a written statement. In less than a month, we’ll be embarking on a two week trip to Shanghai with a few days in Taipei, Taiwan. After the birth of our son about a year ago, we’ve been wanting to take him to meet my grandfather, his great grandfather, in Taiwan as soon as possible. While our son won’t be a year old, and the long flight will certainly be a challenge, we felt that we couldn’t really wait much longer. A couple months ago I flew from Baltimore Washington International to San Diego, with a layover in Charlotte, NC. The flight wasn’t the cheapest but it had the fewest number of layovers for the day I wanted to fly, so I begrudgingly purchased it. As I landed in Charlotte, I checked my email and US Airways notified me that our flight was to be delayed two hours with no reason provided. Later, I would learn that apparently there were “mechanical problems” and after a two hour wait, we were on our way to San Diego. It underscores the risk of layovers and it was annoying that I had to spend two hours of my trip sitting in an airport. I usually fly Southwest, direct with at most a stop (but not plane change) in a city, and very rarely have I ever seen a two hour delay with hardly an explanation. I’d really be interested to learn the statistics of layover delays because that would help me decide how much I’d be willing to pay to avoid wasting two hours. All in all, Charlotte was a perfectly fine airport, though a little chilly at 8AM as the A/C was cranking on overdrive in anticipation of the likely high temps during the day, and I had a Quiznos sub while I watched Tiger Woods play the last three holes at the British Open. Lesson of the day – avoid layovers. Avoid at all costs! Passport Pull List for Tax Dodgers? May 8th, 2012 · Comments Off on Passport Pull List for Tax Dodgers? It appears that there’s a provision in the latest Senate highway bill that would prevent anyone owing more than $50,000 from leaving the country. The IRS would provide passport officials with names of people that owe the Treasury Department and prevent them from leaving the country. Technically, the IRS would file a public lien or assess a levy and that would trigger the notification. If that person is on a payment plan and making on-time payments, they wouldn’t be included. It’s an interesting provision and while it’s likely legal, it wasn’t in the House version of the bill so it might be removed on reconciliation (assuming it passes the Senate). I’m all for anything that makes people pay what they owe but this seems like a lot of additional work. Make your suitcase identifiable: Put some identifiable marker, such as a ribbon or sticker, on your suitcase so you will be able to identify it. Put a business card inside: If your suitcase is lost or badly damaged, they may open it to try and identity the owner. Don’t check valuables: Few airlines insure damaged valuables, especially expensive, irreplaceable ones. Play it safe and don’t put your valuables in a bag you plan to check. Make a travel bag for toiletries: It sounds tedious, but if you’re a frequent traveler it will make your life much easier. Have a formula for keeping track of your wallet, cellphone and keys: Many travelers come up short after going through security, missing something or leaving it behind in the mad scramble to strip down and pass through the metal detector. Stay organized and keep a mental checklist that you can reverse engineer. Anticipate the scanner: Speaking of the metal detector don’t wear accessories, such as jewelry or piercings that could cost you time and sanity. Get a day pass at airline club: Airline clubs are great for relaxing but, more importantly, if your flight is cancelled you will be able to rebook much easier with a membership to one of these clubs. Prior to flying, look for credit cards that offer free checked bags, early boarding, and reward miles: but look out for annual fees! Simplify boarding: Already have your boarding passes printed. This saves you time at the airport and makes it less likely you’ll get bumped in the event of an overbooked flight. These days you can even use your smartphone to present your boarding pass. Once you’re checked in, do yourself a favor and memorize the route to the nearest fire escape: especially if you’re on one of the upper floors. And, perhaps more pertinently, keep your room number handy. Who hasn’t had to take return trips to the receptionist’s desk because they forgot their room number? Obviously, there is no sure way to guarantee an easy-going day of travel. But by heeding some of the tips listed above you can at least maximize your chances of maintaining your sanity and getting you and your luggage to and back from your destination in one piece.